The Windows Vulnerability Scanner application verifies your system for Windows Vulnerabilities. Windows Vulnerability Scanner guides you to update with the right patch to make your system more secure. 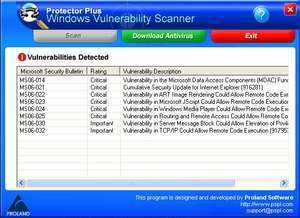 Once the Scan is completed, Protector Plus - Windows Vulnerability Scanner lists the vulnerabilities detected, their risk level and the download location of the patch. It also creates the log file named Protector_Plus_Windows_Vulnerability_Scan. Version 5.4 is a freeware program which does not have restrictions and it's free so it doesn't cost anything. For security reasons, you should also check out the Windows Vulnerability Scanner download at LO4D.com which includes virus and malware tests. Additional screenshots of this application download may be available, too. Windows Vulnerability Scanner has a presence on social networks.